ZIMBABWE – MUSIC fans reportedly ran berserk, destroying furniture after superstar Oliver Mtukudzi failed to turn up for his scheduled performance due to illness. Mtukudzi or simply Tuku was billed to perform at CSC Club in Chinhoyi alongside Suluman Chimbetu and Soul Jah Love but could not make it due to illness. Tuku has a bout of Flu and his manager Sam Mataure confirmed the development saying they were forced to cancel all weekend events. “Yes we could make it to Chinhoyi. Tuku has Flu, it’s true but he is recovering well. It’s not something serious and there is nothing else. “We will have arrangements to have another date for Chinhoyi,” said Mataure. However, ZimDaily heard that what irked fans is that the organisers were aware of Tuku’s illness but did not bother to inform the fans as they were paying at the gate. The show was being charged US$10. The fans only knew of the news when the announcement was made after Sulu finished his performance. The emcees told the full house that Tocky Vibes was replacing Tuku and the youthful musician failed to wow the crowd resulting in him being chased from the stage. “There is chaos here, where are you guys? Mdhara Tuku failed to come to the show,” said a Tuku fan who phoned us early Saturday morning. 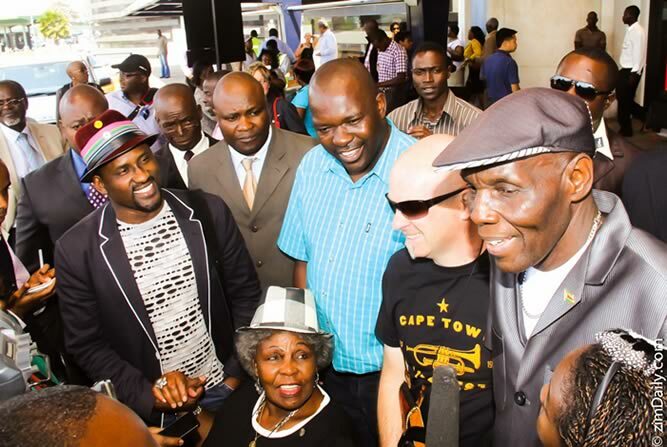 “The organisers didn’t tell us that Tuku is not around. We paid a lot of money only to replace him with Tocky. Who is Tocky Vibes and can he match Tuku’s standards?” queried the fan. Tocky reportedly did not last on stage as he was chased, not just off the stage but outside the venue. Another ZimDaily mole who was at the show said the scenes were so ugly that police had a busy night in office. One of the fans who was suspected to be the promoter, it is said, had his Mercedes Benz S Class scratched. “It was so bad, the fans were so angry. One of the fans was unlucky after fans suspected that he was the promoter and people wanted to overturn his vehicle. Ndiye anga aine mota yakanaka ipapo saka vanhu vakati ndiye chete. “The security then intervened and he had to park it somewhere.” The promoter, Tafadzwa Maridadi, had to call back on stage Suluman Chimbetu who was already in Banket on his way back to Harare. Sulu’s publicist Joe Local Nyamungoma confirmed that his artiste became the ‘messiah’ at this chaotic gig. “Yes we received a call when we were approaching Banket,” said Local. “We had no option, we just informed the guys since they were still around and the fans went calm.